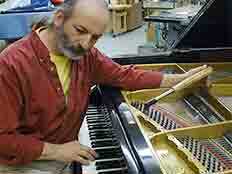 I tune fine grand pianos, as well as humble everyday home pianos. My signature “Whole-Tone” piano tuning service consists of a 2-1/2 hr visit. In this visit I tune the entire piano multiple times… 2 to 3 tuning passes over the entire instrument. The first-pass gets the piano close to “in-tune”, while the second or third pass “fine-tunes”. The fine-tuning creates the beautiful consonances my tunings are known for. What is Whole-Tone Piano Tuning? This is a very fine style of tuning. The technique was developed for fine concert grand pianos. However, it works wonders on ANY piano, be it a grand piano, upright piano, console or spinet. I use this technique whenever I tune, grand or spinet, because my goal is for a piano — your piano — to sound as good as it possibly can. I would love to show you how nice I can make your piano sound! The time to tune your piano is when it still sounds relatively nice. The closer to “in tune” your piano stays, the more stable the tuning becomes. This means the crisp, consonant sound of a fine tuning lasts longer when a piano is not allowed to stray too far from “in tune.” For this reason, I recommend a well played and loved piano be tuned at least twice a year. Less used pianos often get a single tuning each year. This annual tuning will keep the pitch from slipping, but tuned once a year, fine tunings will hold for a shorter period of time, compared to pianos tuned twice yearly. Pianists with a very discerning ear and professional or dedicated amateur practice schedule often request 3 to 4 tunings per year. Whichever tuning schedule you prefer, be it once, twice or four times per year, Damppchaser humidity control system helps the piano maintain and stabilize tunings. to schedule your piano tuning.